Resources for Engaging Research Students - from February 23, 2017 Teachers Talking Session. 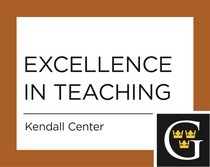 “Solve a Teaching Problem” - These pages from the Eberly Center for Teaching Excellence & Educational Innovation at Carnegie Mellon University offer practical strategies to address teaching challenges across the disciplines including issues of attitude and motivation, prerequisite knowledge and preparedness, critical thinking and applying knowledge, group skills and dynamics, classroom behavior and etiquette, and grading and assessment. The MERLOT ELIXR Initiative - This is a digital case story repository that hosts more than 70 discipline-specific cases dealing with instructional topics such as Understanding Our Students, Innovative Teaching Strategies, Course Design, Technology-Enhanced Learning and Assessment & Evaluation. Most topics contain several digital case stories demonstrating exemplary teaching practices and disciplinary contexts, with related resources for use in faculty and professional development in higher education. Facilitating Discussion: A Brief Guide - Short booklet about the elements of good discussions and how to generate and maintain them in the classroom. Addresses how to create rapport, encourage participation, facilitate participation, get students to talk to and argue with each other, use of small groups, and suggested guidelines for classroom discussion. Scholar as Teacher: Tip-sheets from The McGraw Center at Princeton University - Excellent collection of resources with concrete suggestions on all elements of giving lectures and leading discussion, grading students and course assessment, and understanding student learning. POD-IDEA Center Notes on Learning - 2-3 page papers with suggestions to support improved student learning and address specific ways to facilitate learning.Topics include gaining factual knowledge; learning fundamental principles, generalizations, or theories; learning to apply course material (to improve thinking, problem solving, and decisions); developing specific skills, competencies, and points of view needed by professionals; acquiring skills in working with others as a member of a team; developing creative capacities; gaining a broader understanding and appreciation of intellectual/cultural activity; developing skill in expressing self orally or in writing; learning how to find and use resources for answering questions or solving problems; developing a clearer understanding of, and commitment to, personal values; learning to analyze and critically evaluate ideas, arguments, and points of view; acquiring an interest in learning more by asking questions and seeking answers. IDEA Papers - 10-20 page papers addressing the general areas of teaching and learning, faculty evaluation, curriculum design, and assessment. Specific topics include team teaching, reflective ethical inquiry, active learning strategies in face-to-face classes, using graphic organizers to improve teaching and learning, effective classroom discussions, and more. Design and Teach Your Course - This website from Carnegie-Mellon includes links to help you design your course as well as teach it. It addresses topics like recognizing who your students are, identifying situational constraints, and implementing effective instructional strategies such as lectures, discussions, labs, studios and case studies. Tutorial for Designing Effective and Innovative Courses - In the most commonly-used method of course design, an instructor plans a course around a list of content items important to the discipline, with those items typically taken from a chapter list in a good text. Our tutorial, on the other hand, centers a course around a set of overarching goals that answer the question, "What do I want my students to be able todowhen they have completed the course?" Course Design Aids - These resources from Stanford University offer ideas about designing courses backwards, thinking about and communicating clear course goals, and Bloom’s Taxonomy of Educational Objectives.